We’ve seen Naruto as a hero and leader; now, in Boruto: Naruto the Movie we get to see him as a father. As it turns out, he’s pretty bad at it. That doesn’t mean this is a bad movie. Boruto is basically two movies in one film. The first (and by far the better of the two) is the tale of the titular character. Boruto, son of Naruto and Hinata, is a headstrong child and an emotionally damaged one—largely due to his relationship with his father. 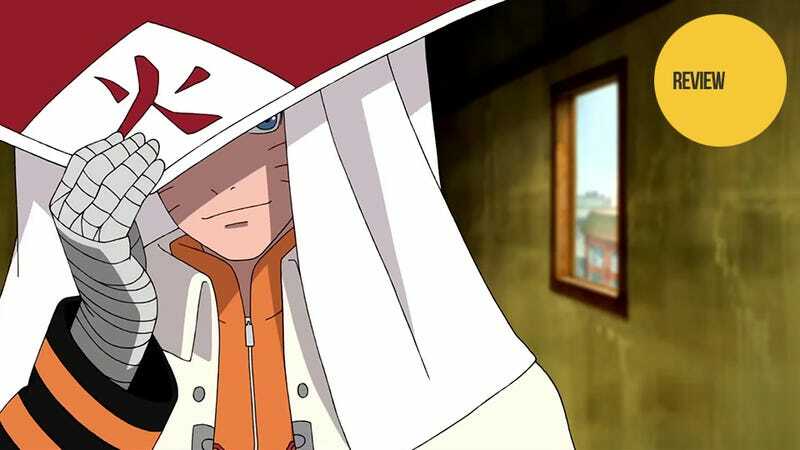 Unfortunately, the best hokage makes for the worst father. Naruto is a workaholic. More than that, he uses his shadow clones constantly to help out with the work. The problem is, when it comes to important family events, he simply sends a clone instead of going himself. Sometimes, he doesn’t even bother with a clone, sending relatively impersonal emails instead. Watching not only himself but also his sister and mother being treated as secondary in importance for all of his life, Boruto has developed more than a small amount of hatred for his famous father. But behind that hate is the need to be recognized by his father—to for once have Naruto put his own son before everything else. To accomplish this, Boruto believes he must surpass his father. This drives him to try to do everything on his own, using shadow clones rather than trusting his own teammates and friends. He also goes to Sasuke, seeking to train under the wandering ninja to learn his father’s weak points. In training, Boruto is often quick to anger. For him, failure is not an option. To fail means that his father is justified in treating him as something of secondary importance. Other characters play off of Boruto’s insecurities—namely a pair of scientists who have developed a miniaturized scroll launcher that allows even low-powered ninjas to use powerful skills. By giving one of these devices to Boruto, they hope he will use it to pass his ninja qualification exam and prove the worth of the new invention. Of course, as Naruto has banned the device, using it is classified as cheating. Boruto is faced with a terrible choice: cheating but potentially earning the respect of his father and the people of the village or relying on his friends and his own power and likely failing—proving his father’s neglect to be deserved (in his own mind at least). At that moment, the film becomes another movie entirely—not one about Boruto, but one of pure fanservice where once again we watch Sasuke and Naruto go all out against a strong enemy in a lengthy, flashy fight scene. It is the best-looking Naruto fight scene I have ever seen—and the animators deserve all the congratulations in the world for a job well done. However, the villain is completely irrelevant to Boruto’s story. He is only in the film to give it a climactic action scene—even as doing so horribly undercuts the rest of the film. Boruto’s role in the final act of the film is almost exclusively one of an onlooker—gawking along with the rest of the audience at just how “cool” his father is. And while there is an attempt at some father-son bonding at the end of the battle, it serves as a weak and unbelievable resolution to their rocky relationship. More than that, many of the major themes of the film are left unresolved. Boruto never learns to rely on his teammates, and the ramifications of cheating are completely swept under the rug. Boruto is a fantastic film that uses a tale of ninjas to explore the all-too-common real world problem of trouble between a busy father and a neglected son—until the final act where it becomes a cliché Naruto movie about Naruto punching a villain really hard. Last year’s Naruto movie, fittingly called The Last, was billed as the final Naruto-centric story. If only that had turned out to be true. Boruto: Naruto the Movie was released in Japanese theaters on August 7, 2015. It will be coming to US theaters later this year.